Leading lines can make or break an image depending on how they are or are not used. 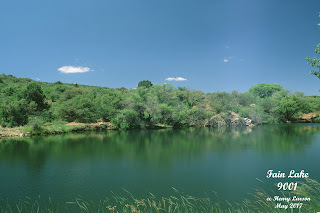 The above is an image of Fain Lake in central Arizona. It has a few nice enough reflections but overall the image is rather blah. There is nothing to draw you to a focal point and the rather overall pastel green coloring is nothing very exciting. Why is it that some images instantly attract and some instantly repel? The answer could well be a question such as-- Is there a part of the image to which the eye is inexorably drawn? If so why? The answer most times is there are image lines creek,path, river, bridge etc. that draw they attention of the viewer toward the principal object of the image. This then becomes important in the construction of photographic images. This also emphasizes the importance of image composition which I usually label image construction. So as you look for and set up an image to capture it is my opinion that there are a series of steps that should be taken. First is the overall area to be captured. Then make sure that there are lines of objects that point or at least lead toward this main object. If you will notice the river leads your attention from the lower left hand corner to the right hand of the photo. The purpose of this is to cause the observer to ask themselves “Where is this river going?”. This may help the viewer to relax and actually think a little! And there you have it! A use for a leading line. Having accomplished this it is now time to proceed to the next steps of composition and capture. Does this methodology consume time? Of course! But the results are invariably worth the effort.